The other day the boys were watching yet another episode of Garfield that they had checked out from the library and I said, "I think I'm going to just sit around watching Garfield all day! You guys can cook the meals and clean the house and do the laundry!" The boys seized on this idea, and while I didn't sit around watching Garfield, I did have boys helping me out more, and Paul had boys volunteering to dig fence post holes. 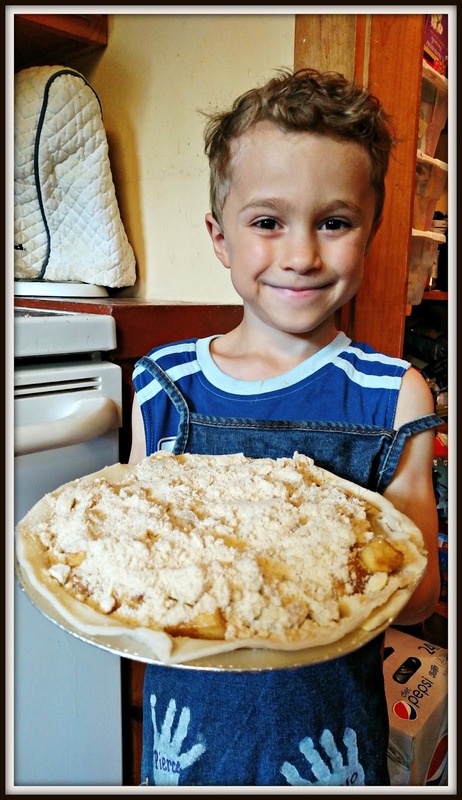 Cort learned how to make deviled eggs and apple pies. He did an excellent job and was so proud of his creations. The next day, when we attended a church potluck, he watched in pride as every last deviled egg was eaten. The two apple pies he made turned out very well too! Sadly, we didn't get many apples this year due to a late frost, but at least we put the few we had to good use. Readers, who would you like to trade places with for a day? What a great photo! So glad Cort's deviled eggs were a hit at the potluck. What sweet boys you have! That is quite an accomplishment for Cort---the eggs and the pie. I think I would like to be an archaeologist on a dig for one day. That was one of my dreams when I was a girl. I love it! That's one thing I think kids miss out on too much these days--learning how to cook. My oldest made a pan of lasagna by himself yesterday, and I beamed with pride. I asked him how prepared he felt to go out into the world and cook for himself. (He's 15.) He said he felt pretty confident. Now that's a life skill, eh? What a fun thing to do! I do believe that boys should learn to cook, so that in the future they can take care of themselves, and their wives if need be. Cort is really growing! How wonderful, it's never too soon to teach the kids responsibility. Adorable Cort; he has the cutest expression. That is so sweet and I'm sure they enjoyed helping out! The cat. Except for the licking part. Wow!!! And your kidding ,, Cort can make an apple pie and deviled eggs!! Wow!! Ha I love when the kids take a joke and make it real. :) The pie looks great and hurrah that the deviled eggs were a big hit! I sometimes wish I could trade places with my students. Good job on the pie and eggs Cort! Isaak loves making scrambled eggs. He's really a creative boy! I love that your boys are such good helpers; you've taught them well. So fun! You may just have inspired a new hobby for Cort. (Maybe you'll see him around the kitchen more often--and not just to eat!) He gets to truly learn how to cook "from farm to table." How cool that you used your own apples this year (even though there were few)!